Even one point on your ACT Composite score can make a difference in receiving scholarships and gaining admission to the college of your choice. Your coursework already prepares you to take the ACT, but additional practice can help you feel comfortable, confident, and ready to do your absolute best. GET READY – It’s a great way to prepare for the ACT, especially since it’s built by the test makers themselves. GET COMFORTABLE – The practice questions and tests are taken from previous ACT tests, which familiarizes you with the format. GET CONFIDENT – As you see scores and percentages change with each course and practice session, you’ll know you’re getting the hang of it. Another option from ACT is www.act.org/academy where you can get a free personalized online learning tool that has videos, games, interactive practice questions, full length tests and much more. Click here for ACT registration form. 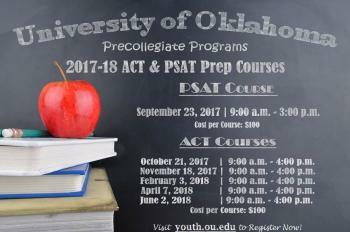 Visit youth.ou.edu to register for PSAT or ACT prep courses today! Contact 405-325-6897 or precollegiateprograms@ou.edu with any questions. WHY attend NSU’S ACT Prep Camp? The ACT Prep Camp will help students identify their strengths and weaknesses and will better prepare them for what to expect on test day. Students will be given a workbook with testing tips and study skills specific to the ACT exam, covering all four subject areas. Sample practice tests will be administered from the workbook during the ACT Prep Camp. College Admission officers agree that your score is considered the second most important factor in the college application process. Everyone benefits from additional points on the exam. Depending on your starting point, more points help you to get into your dream college, expand program choices, and increase scholarship potential. Many students decide their scores are “good enough” without realizing their score potential. Don’t limit your college choices or scholarship potential. *a minimum of 6 students must be enrolled at each campus before the camp will make. If you are enrolled at a site that does not make we will contact you regarding changing locations or to process your refund if the other sites do not work out for you. Saturday Prep Camps are from 9 a.m.-1 p.m. and cover Testing Strategies, English/Reading, and Math/Science. Fee: $85, includes a workbook. A minimum of 6 students must be enrolled at each campus before the camp will make. If you are enrolled at a site that does not make we will contact you regarding changing locations or to process your refund if the other sites do not work out for you. Regular Course Refund Policy: 100% refund will be given if the request is made before the first scheduled class meeting. No refunds will be given after the first day of class and cannot be issued for non-attendance. All fees will be refunded if the class is cancelled due to insufficient enrollment.